It’s not easy being green especially when 13 of the 20 most-polluted cities are in your country. Those in the transportation industry can certainly certify to that fact. The truck industry always relies on diesel fuel to power the trucks that hit the roads everyday to deliver the billions of tonnes of goods that keep our economy running. But the bitter truth that we are ignoring is the pollution caused by the truck transportation. As air pollution in India is a serious issue with the major reasons being biomass burning, fuel adulteration, vehicles emission and traffic congestion. In defiance of this reality, truck industry still has the opportunities to take some proactive actions towards reducing their carbon footprints. The structure of the trucking industry and the designs of the trucks themselves, have remained consistent for the past five decades. As many automobile giants come out with eco-friendly hybrid cars, trucks continue to gulp gas and emit pollution as they traverse the country. 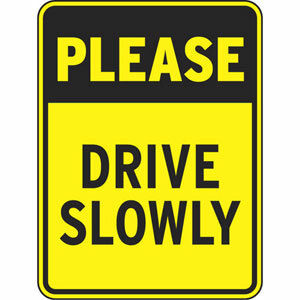 When you first read the sub-heading ‘Drive Slow’ it must remind you of an old traffic sign. It sounds so simple and is an easy task to do but most of us don’t really care about those traffic signs, because if we really do then there wouldn’t be any accident and air pollution. The faster any vehicle goes, the more fuel it will consume. If you add tons of cargo in a trailer or truck, it will consume even more fuel. One of the major reasons which cause truck drivers to speed up is the unrealistic schedules they’re given to complete the order. They must drive faster to catch up the deadlines. Some trucking companies pay their drives according to the distance they travel. More distance covered means higher the paychecks. Sadly, speeding up increases the more consumption of fuel but it also results in truck or road accidents. Speeding is the only factor responsible for the maximum number of deaths on Indian roads. As per the Ministry of Road Transport & Highways 1,39,671 people lost their lives on India’s road during 2014, which means 382 deaths per day, which means 1,682 times more than terrorism. 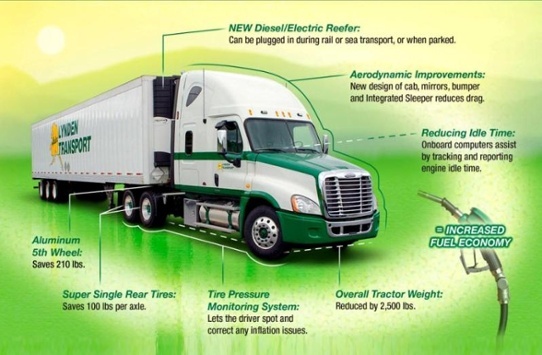 The first step that the trucking industry can take toward being green is to reduce the speed limit of the trucks. An average speed limit of an Indian truck varies from 20-65 km/h as per the different states. Nowadays, so many hybrid car models have been introduced, the next step is to align that technology to make it applicable in trucks. In addition to ethanol fuels and electric trucks, another possible source of fuel is solar energy. The tops of the trucks offer much area where solar panels could be placed. This would not only save fuel, it would mean lesser stops for the drivers because of not having refuelled. So, now you can imagine a cargo arriving at its destination more early. The fuel costs of a delivery truck are much more than the fuel cost of a car as the commercial truck travels much distance. 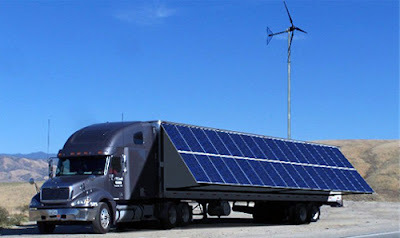 But having a truck which runs on the solar energy can save a much more money than even an electric car. It’s three times harder on an engine to idle than to pull a load. Leaving engine on idle means wasted fuel and carbon emissions. In the world of technology, truck engines can be placed so an engine shuts down automatically after being on idle for over few minutes. There are over 5,000 truck-stops for long-route drivers in America, providing a service of Truck Stop Electrification, where they provide heating and cooling through an overhead joist via side window of the driver’s seat. These services show respect to the truck drivers and helps them to recover their energy during long-time journeys. If Indian government could bring this key service for our Indian truckers, then this will play a major role in the reduction of air pollution. 1. The usage of low-glutinous engine lubricants that are less resistant, reduce friction and energy loss. 2. Transport companies should install aerodynamics panels on the trucks that reduce dragging and improves fuel efficiency. 4. Single Rear Tires are around for over a decade, and their market piercing continues to grow year after year. Single rear tires causes reduction in fuel consumption, maintenance and weight, and saves up to 45 kgs per axle. With the price of fuel at heinous levels, anything that reduces the fuel cost is most welcomed. Updating to new equipments may look like an unnecessary initial expense, but can pay well for the long run. Updating equipments and replacing older trucks in your fleet means fewer maintenance-related expenses, regard as identical to fewer out of service trucks for repair, resulting in more revenue. Fuel consuming technologies also tend to decrease pressure on the engine, means trucks can stay in service for longer period. Having technically advanced trucks with futuristic and eco-friendly techniques will attract more customers in this logistic business. Every transport firm should incorporate environmental awareness into their mission statement. When it comes to the transportation of their products, customers will be willing to favour a carrier that also makes green practices a priority. No Comment to " Here Comes The Green Truck "